Brass From The Past -- A Tribute to the Legends of Rock & Soul. One of the Best Cover Bands in Chicago! BRASS FROM THE PAST is the HOTTEST horn band in the Midwest. 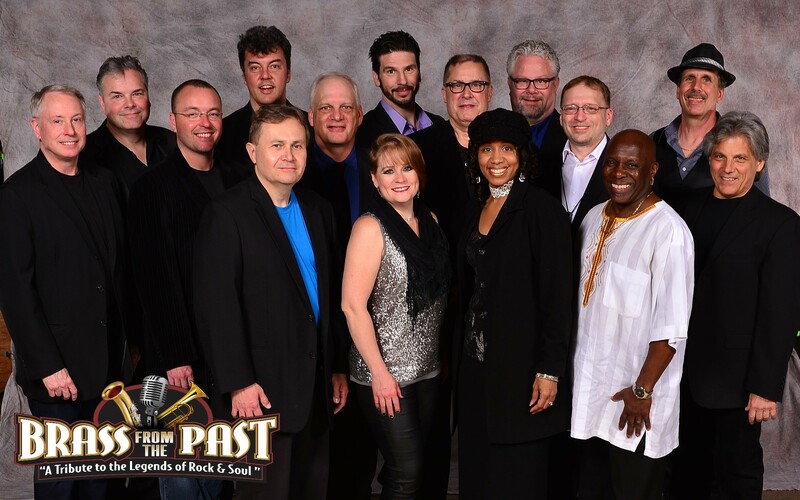 Featuring Chicagoland’s top-tier musicians, the band offers an unstoppable 6-piece horn section, tight 4-piece rhythm section, and 3 powerful singers who command the stage.Brass from the Past is one of Chicago’s best cover bands. Featuring Chicagoland’s top-tier touring and studio musicians, the band offers an unstoppable 6-piece horn section, tight 4-piece rhythm section, and 3 powerful singers who command the stage. This is no ordinary band! Brass from the Past performs the music of your soul and brings you back to the 60s, 70s, and 80s — a playlist no other band can touch. The classics of Motown, R&B, funk, soul, and rock are our specialties. We cover the music of Stevie Wonder, Four Tops, Temptations, Michael Jackson, Chicago, Aretha Franklin, James Brown, BS&T, Pattie Labelle, Bruno Mars, Chaka Kahn, O’Jays, Tower of Power, Prince, Tina Turner, Bee Gees, and many, many more.